Taking inspiration from disrupted TV images, adidas Originals is set to release the adidas NMD R1 Color Static edition. This adidas NMD is highlighted by its Multicolored Primeknit upper, that creates a disruptive new take on the modern classic silhouette. 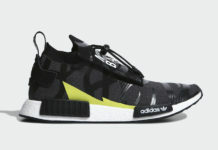 Other details includes a welded TPU lace eyelets and custom heel tabs, atop a Boost midsole and EVA plug inserts completed with a rubber outsole. Look for the adidas NMD R1 “Color Static” to release on November 11th at select adidas Originals retailers and adidas.com. The retail price tag is set at $170 USD. UPDATE: On-feet photos of the “Color Static” adidas NMD R1.